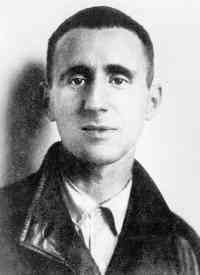 Bertolt Brecht was a German poet, playwright, and theatre director. An influential theatre practitioner of the 20th century, Brecht made equally significant contributions to dramaturgy and theatrical production, the latter particularly through the seismic impact of the tours undertaken by the Berliner Ensemble�the post-war theatre company operated by Brecht and his wife and long-time collaborator, the actress Helene Weigel�with its internationally acclaimed productions. Brecht was concerned with encouraging audiences to think rather than becoming too involved in the story line and to identify with the characters. In this process he used alienation effects (A Effekts). Brecht developed a form of drama called epic theatre in which ideas or didactic lessons are important. Something ignoble, loathsome, undignified attends all associations between peope and has been transferred to all objects, dwellings, tools, even the landscape itself. Boy meets girl. So what? The rejection of empathy is not the rejection of emotions.